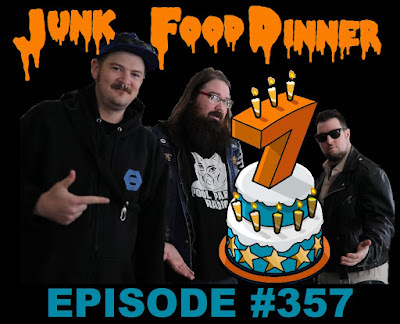 JFD returns after a long week of partying with a king-sized episode to celebrate our 7-year anniversary! Up first, the gents regale you with tales of their meet up in Cincinnati where they saw bad movies on the big screen, attended the HorrorHound Convention, saw one of the last performances of the Ringling Bros. and Barnum & Bailey Circus and most importantly ate lots of coneys and 3-ways. We also break out The Randomizer 5000 to randomize some contest winners and assign some decades for our upcoming JFDecades theme shows. And as is tradition on JFD every anniversary, we take a look back at all the movies we've watched for the podcast over the last year and recount our Top 5 Favorite and Bottom 5 Least Favorite flicks that we were forced to watch. All this plus witty banter between friends, listener voicemails, Nerd News, Blu-ray Picks, continued lack of overt police involvement, and a whole lot more! Also, if you like the show, please take a minute and subscribe and/or comment on us on iTunes, Stitcher, Blubrry or Podfeed.net. Check us out onFacebook and Twitter! We'll rock The Queen City with your love and support.